Computer cards are devices which are used to connect peripheral components. They are a printed circuit board used to accomplish a specific task. This is a typical interface used mostly. If the on-board card fails to work, it is possible to plug a new card on the PCI slot and continue your work. This is one of the advantages of having PCI slots on a motherboard. Current computer already have all the main cards integrated with the main board, no need to buy additional cards. Unless for better performance specially if you are in video gaming and graphical applications. Several kinds of cards can be fitted on a computer. Modern computer incorporates at least graphics, sound and network cards on the main board – means they are built with the motherboard. 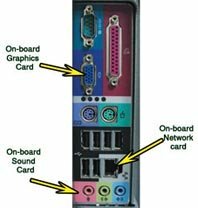 Internal modem and TV cards are the other types of cards which can be hooked on PCI slot.